What's wrong with these vehicles? The mechanic has to repair the lights, check the wires, fix the wipers, and pump the tires. 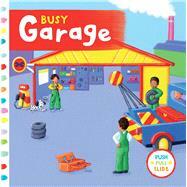 Welcome to the busy garage, where kids can play with the tabs as they learn about cars! Rebecca Finn studied Illustration at Kingston University and now lives in Kent, UK. She won the Myra Robertson Baby Book of the Year Award 2012 for her work on the Busy Book series.